Detailed map of Marienburg, ca. 1925. 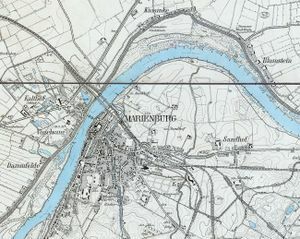 Marienburg (also known as Marienburg an der Nogat and Marienburg in Westpreußen, now Malbork; coordinates: 54.033333, 19.05 [54° 2′ 0″ N, 19° 3′ 0″ E]; population in 1875, 8,526, in 1905, 13,095, in 1939, 26,159, in 2006, 38,478) is located on the Nogat River in Poland. The Marienburg Castle, built in 1274, was the capital of the Teutonic Knights, falling to the Poles in 1460. Marienburg became part of the Polish province Royal Prussia after the Second Peace of Thorn in 1466. It was annexed by the Kingdom of Prussia in the First Partition of Poland in 1772 and made part of the Province of West Prussia the following year. It had a population of 4,575 at that time. Under the terms of the Treaty of Versailles after World War I, the inhabitants elected to remain in Germany, and Marienburg was included in the Regierungsbezirk Marienwerder within the German Province of East Prussia. 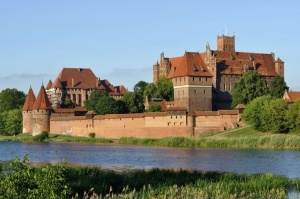 In 2012 Malbork was the capital of Malbork County in the Pomeranian Voivodeship. In the second half of the 17th century many foreigners, including Mennonites, were admitted to the castle grounds and allowed to pursue their trades there. Their competition with the citizens caused the latter to send a complaint to the king, and after decades of strife the city took the castle in lease, and the Mennonites, who had hitherto not been granted citizenship, were now made citizens. Beginning in the latter years of the 17th century the Mennonites held services on the castle grounds, and later in Sandhof near Marienburg in private homes. The 1776 Prussian census lists 25 Mennonite families in Marienburg with the following surnames: Busenitz, Conrad, Dircksen, Ens, Epp, Friesen, Hahn, Kroecker, Penner, Peters, Wiebe, Wiens, and Woelcke. In 1820 Marienburg had 4,817 inhabitants, including 134 Mennonites. In 1906 the Heubuden congregation built a meetinghouse in Marienburg; services were held here every Sunday and church holiday, but there was no organized congregation. In 1940 there were 350 Mennonites in Marienburg. The group was dissolved when the Russians came in the spring of 1945 and the Mennonite population was evacuated westward. The meetinghouse was converted into a cinema. Dormann, E. and H. Eckerdt. Geschichte des Kreises Marienburg. 1862-1868. Hunsberger, Wilson. "The Danzig Mennonite Church Buildings Today." Mennonite Life 4 (July 1949): 10. Driedger, A. "Marienburg (Pomeranian Voivodeship, Poland)." Global Anabaptist Mennonite Encyclopedia Online. December 2012. Web. 19 Apr 2019. http://gameo.org/index.php?title=Marienburg_(Pomeranian_Voivodeship,_Poland)&oldid=144336. Driedger, A. (December 2012). Marienburg (Pomeranian Voivodeship, Poland). Global Anabaptist Mennonite Encyclopedia Online. 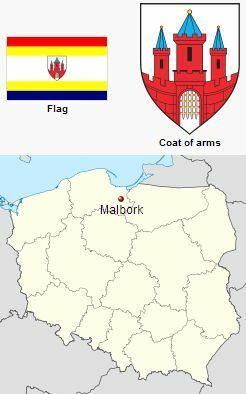 Retrieved 19 April 2019, from http://gameo.org/index.php?title=Marienburg_(Pomeranian_Voivodeship,_Poland)&oldid=144336. Adapted by permission of Herald Press, Harrisonburg, Virginia, from Mennonite Encyclopedia, Vol. 3, p. 481. All rights reserved.